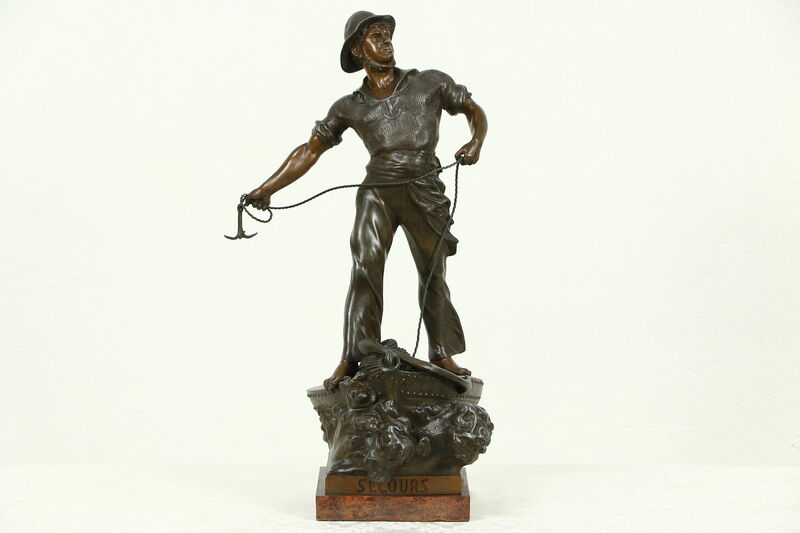 A statue titled "Secours," or Rescue, depicts a sailor standing at the prow of a ship throwing a line. Signed "Waagen," this 1900 era sculpture is cast in spelter, a white metal alloy similar to pewter. The original bronze patina is very well preserved on this antique work of art. Dramatic waves rise under the boat, as the sailor strains against the wind. The noted sculptor, Arthur Waagen (1833-1898) was born in Lithuania, then East Prussia. He lived and worked mainly in Paris, where he won numerous prizes and was widely exhibited. The wooden base has an original hand painted red marble finish. Dimensions are 13" across, 9" deep and 23" tall.